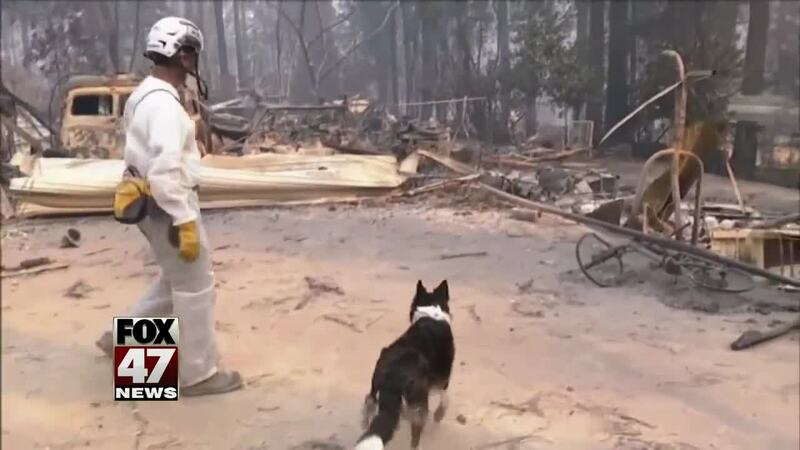 The death toll from the Camp Fire in Northern California has grown to 63 people, Butte County Sheriff and Coroner Kory Honea said Thursday evening. The number of missing in Californian wildfires has soared to 631, as authorities added hundreds of names to the lists of the unaccounted for Thursday, in what has become the deadliest and most destructive wildfire in the state's history. 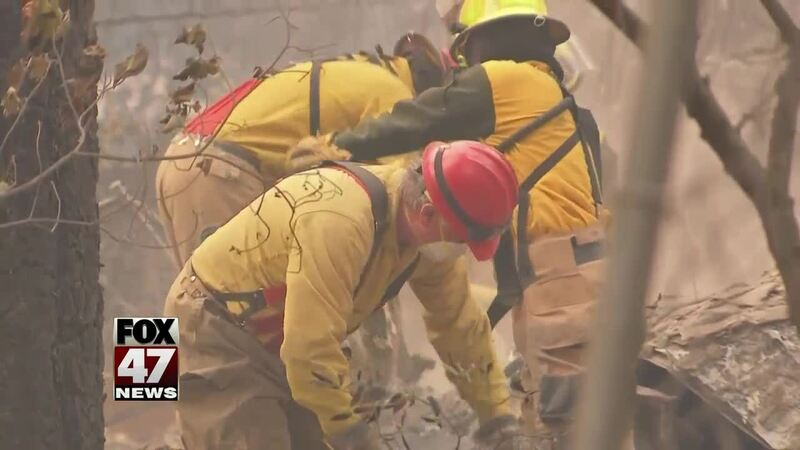 Butte County Sheriff and Coroner Kory Honea said Thursday evening the death toll from the Camp Fire in northern California had grown to 63 people. Seven sets of remains were discovered Thursday, he said. At least two other people have been killed in another, separate wildfire in Southern California, putting the state's death toll at 65 since the two blazes began last week. On Friday hundreds of rescue personnel -- deputies, National Guard troops and coroners -- dressed in white overalls sifted through smoldering rubble and checked mangled cars, searching for human remains. Honea said the number of names on the missing list soared after investigators added information from callers who rang the dispatch center on the day the fire erupted and reported people who were missing in the chaos. Some of the names on the Butte County list appear more than once and it's not clear if any are duplicates. Officials have said it's hard to determine the number of missing, because some people may have evacuated and can't be reached with cell phone service unreliable due to the fire. "There are a lot of people displaced and we're finding a lot of people don't know we are looking for them," Honea said. The fire turned the hard-hit town of Paradise into ash and debris and also devastated the nearby communities of Magalia and Concow. Honea said three sets of remains were found Thursday in Paradise, three in Magalia and one in Concow. Honea has invited relatives of the missing to visit the sheriff's office in Oroville so authorities can collect DNA samples from them. The DNA will be used to help identify fire victims, Honea said. "This is a daunting task. We feel really bad for the people who don't know what happened to their loved ones and our hearts go out to them," Butte County Sheriff's Investigations Sgt. Steve Collins said. "We want to give them some answers." The somber search for the missing in Butte County is painstaking. It involves 461 people and 22 cadaver dogs in Paradise, Magalia and Concow, authorities said. Dozens of National Guard troops have joined the search effort, Collins said. Once they find the remains, with the help of forensic experts, the coroners are sent to recover them. To enable searchers access to the destroyed structures, crews help move collapsed buildings and roofs out of the way. The white overalls protect the rescue workers from ash and debris and help avoid contamination, Collins said. "They are going to be searching vehicles that have been burned. They'll be searching residences that have been burned. Checking around the residences ... our mission is to find the victims from this fire, recover them and get them identified and notify the families to give them some answers." The search area is wide and spread out. "It's not just the area; it's the number of homes, the number of trailers, the multistory buildings. All of that changes the complexity of this operation," Collins said. Experts are conducting targeted searches by first sending deputies to areas in which people have been reported missing. The number changes daily with more calls coming in. "We're trying to follow up with those people who are calling in to find out if they've made any contact with their loved ones," Collins said. "We're asking people to call us if they do come in contact with their loved one so that we don't spend time looking for somebody that's already found." Families who lost their homes in the fires are going to have a very hard time finding a place to live, Butte County Housing Authority Executive Director Ed Mayer said. "We just had 10% of our county's housing stock erased in one day; it's hard to convey the significance of that," he said. A Walmart in Chico has a parking lot full of vehicles, including motor homes, in which people are living, often running the heat in their cars and trucks all night. Other people are staying in tents. "It's been a week and people have been great, but I don't know how long it's going to last," Mayer said. "Short-term, we are fine, but long-term we are not." One of the selling points of Paradise was its affordable housing, but that's been erased, Mayer said. "And there is nothing to replace it" for low-income families, he said. More than 9,600 firefighters, including many from out of state, are battling wildfires across California. The Camp Fire, which has destroyed about 9,700 homes and scorched 141,000 acres in Northern California, is one of several in the state. By Thursday, it was 40% contained. Adding to the misery for evacuees, officials reported a suspected outbreak of norovirus at a shelter in Chico. Evacuees showed some symptoms, but officials are waiting for test results for confirmation. The stomach bug causes vomiting, nausea and diarrhea. In Southern California, the Woolsey Fire -- which, like the Camp Fire, began November 8 -- has killed at least two people in Malibu. Authorities are trying to determine whether a third person found in a burned home in Agoura Hills died as a result of that fire, the Los Angeles County Sheriff's Department said. The Woolsey Fire has burned more than 98,000 acres and destroyed more than 500 structures . It is 62% contained. More favorable weather conditions for firefighters are in the forecast. More than 230,000 acres burned in California in the past week. That's larger than the cities of Chicago and Boston combined. And in 30 days, firefighters have battled more than 500 blazes, said Cal Fire, the state's forestry and fire protection agency.